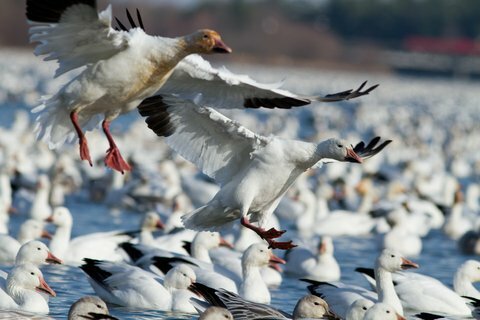 The ultimate dream for every snow goose hunter is to see the sky filled with thousands of birds approaching like a feathered storm, but making that dream a reality is not easy. Snow geese are wary birds and it can be difficult to locate them. However, if you do some diligent planning and research, you can significantly increase your odds of taking a few home in the bag. As with many types of hunting, quality scouting can make the difference between success and a frustrating outing. To find the best snow goose hunting areas, you need to get out in the field to find the areas where the birds will be feeding. In most cases, the snow geese will remain in a feeding area until there is not any more food available. This gives hunters a good chance to locate birds and hunt them for a few days at the same spot. Concentrate your efforts on areas that historically have high numbers of snow geese move through it. Odds are good that you will see good populations of snow geese in these areas, which increases your odds for success. In the spring, snow geese are moving quickly toward their northern nesting grounds, but they will slow or stop when they encounter the snow line. This is because they need food sources that are not covered by snow and water in its liquid form. If you can find this line, that is a great place to begin your hunt. One of the keys to successful snow goose hunting is a good supply of decoys. To draw in a high number of snow geese you need a high number of decoys. Make sure you have lots of them. A good rule of thumb is to set out at least 500 decoys, but 1,000 is much better. Your decoys should include a combination of quality decoys, along with the plastic wind-sock decoys or even white rags. An oval pattern of decoys works especially well. Your planning should include locating an area where you can stay up-wind of your decoys for better shots at the geese. Staying down-wind can result in very difficult shots, because the birds can end up behind you. If you are using an e-caller, keep the sounds realistic. Take your time before the hunt to obtain clear sounds that fall in line with the number of birds that will likely be in the area. Too much sound can be more detrimental than no sound at all. Also, bring enough speakers, so that you can spread them out so they provide an even level of sound from different directions. Good preparation for snow goose hunting is essential. If you do the hard work beforehand, you are likely to dramatically increase your level of success this season.